Still under the pressure of Brexit, Consumer Price Index also affected GBP in February. 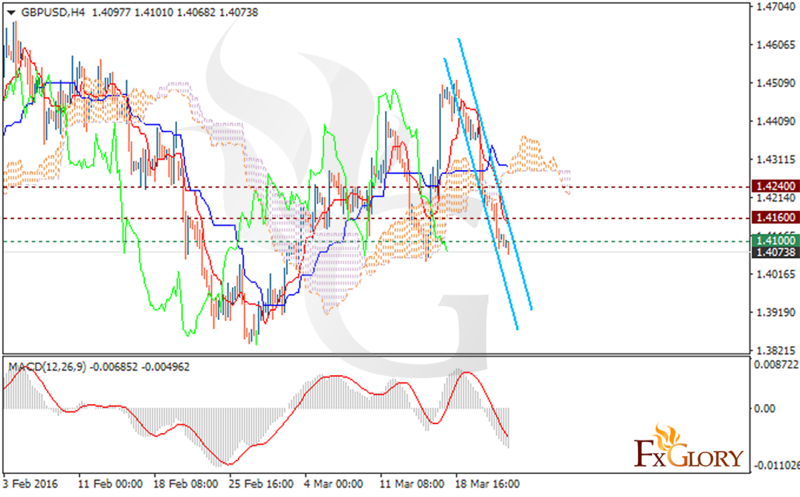 GBPUSD had a decline for today and found support at 1.41. Deciding on this pair is tricky for today and traders can wait for better chart settings to make up their minds. The Ichimoku is showing a strong sell signal since the price is under the Ichimoku Cloud and the Chinkou Span. The Kijun-sen shows a horizontal trend while the Tenkan-sen shows a fall. Furthermore the MACD indicator is in negative territory confirming the price decrease. Sellers can target the support level at 1.4000.